Hi friends, today I’m starting a new series where I’ll be sharing our top curriculum picks by subject. I also have them by grade level as well! These are all things that we’ve used and enjoyed over the years. And hopefully these videos will help you get started researching which curriculum will fit your family the best! 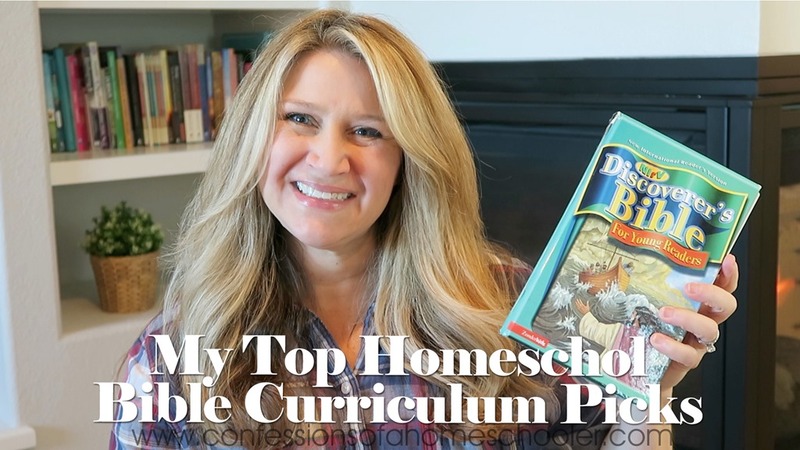 Watch my Top Homeschool Bible Curriculum Picks video here! Want more info? Stop by my Bible Curriculum Forum where I shared some of my favorite resources and my community piped in with their favorites too! Love this new series!!!! You introduced us to Home School in the Woods this past year, and we are so thankful for that! My kids fell in love with history, and we are having a blast! Looking forward to ALL the subjects! Hi Erica! Thanks for this info. How do you incorporate the dvds (both Friends and Heroes and Nest Family DVD) into your weekly homeschooling routine? We just schedule to watch them during Bible time. Some days we do it at the end of the day as well, but I find it easier to do it first thing because everyone tends to finish the rest of their work at different times.